Unplanned, for a while today I listened to live streaming from the ACT Party conference. The unexpected opportunity presented and it was convenient (just finished mowing the lawns and cleaning the car, and was checking e-mail). My interest was initially desultory. However, I've never attended a Richard Prebble speech that didn't engage. And that's where I joined in, minutes before he was introduced. Prebble quoted a scale of measures necessary for freedom eg competition, and tested them against recent major speeches by main party leaders Key and Shearer. Did those measures rate a mention? Key just did better, but Prebble said his could easily have been a Labour leader's speech. He referred to Key's claim that National was continuing to increase productivity and growth (gets a tick for mentioning 'productivity' - one of the prerequisites for freedom) but said it would have been more convincing if Key hadn't used the word 'continuing'. When did they start asked Prebble? And then he made amusing comparisons between various historic big name leaders who wanted NZ to be like another country ( as per Shearer and Finland). For Norm Kirk it was for NZ to be the Switzerland of the Pacific. (My comment - not forgetting that ACT has cited Ireland and Singapore enviously in past times). Or the many versions of a 'smart' economy promoted over the years culminating in Clark's 'knowledge' economy which had Prebble envisaging the "E = M whatever it was......" floating over the country. Notably Prebble did describe Key as possibly the "most talented politician" he has witnessed. Thinking about Jim Anderton and Peter Dunne, no party yet has rebuilt from one, although Winston Peters overcame even worse odds. I am not going to make a prediction about whether or not ACT can. Prebble talked about a book which had tested 80,000 (that sounds high? May be misheard) political 'expert' predictions which found that in the main, tossing a coin would have been more accurate. And I don't wish ACT ill.
My husband wasn't hanging on Banks' every word and wondering why I was tuning in. As I said to him, we will have to vote for someone next time. And this is one of limited options. "We used to have a benefit system that provided for a few. We were a nation that saw welfare as a backstop, as something you went on if you hit dire straits. Many were on Welfare because they were hit alright Welfare was a way out of domestic violence. It was also for those who were cruelly widowed and there was no such thing as being born into welfare. But what about today? In the context of welfare; who are we now? Now we have 220,000 children living in welfare dependent households. We have nearly 7,000 babies born to teen mums, most of who will be on a benefit for at least seven of the next 10 years and many for a lifetime. One third of women currently on the DPB started on the benefit as teen mums. That is more than 30,000 people. Is this the system we envisaged? It is not who we were. It is who we are. But is it who we want to be? I am the Minister of Social Development. I head up this mammoth beast we call the welfare system and I will not sit back and accept that this is the best we can do by people. I do not apportion blame. I think no less of someone on a benefit than I do on any other New Zealander. In fact I often think more of them because I acknowledge and respect how damned hard a life it can be. So, I will believe in them, their ability and their contribution. I will believe in their path out of welfare into a path with opportunity. I will reform the system." "Family Start. You have probably already heard about some changes to Family Start. Family Start is one of MSDs flagship programmes. It costs about $31 million a year and on average about $5,000 or $6,000 per baby. I have heard it called the ‘Rolls Royce’ of programmes because it is ‘top of the line’ and worth so much more than any other program. Family Start has been running for more than 14 years. As Minister I had to question if it was getting the kind of results that it should be. After two independent reviews it was ascertained that some Family Start providers were doing a great job, some were doing okay and some were doing a poor job. But what was alarming was that some were considered to potentially be doing damage. The next logical question is why? And of course there were a number of complex reasons. One of which though was the level of support from MSD. These providers were more or less being left to it They were being asked to tick boxes and fill in a ream of nonsense paperwork. So I spoke directly to providers and pulling no punches, I laid it out straight. There had to be change and I would spend more time and money supporting that change. A year later and some changes had been made but not enough. Again I fronted and told them that although progress had been made, some had not made any changes and more needed to be done. In fact in that speech I said, “…for some of you this is your second strike. Three strikes and you‘re out." A few weeks ago Family and Community Services announced that five providers would not have their contracts renewed this year. This was not done lightly but the families these providers were supporting needed results. I know that home based visiting can and does work and so I will back it. But results are absolutely paramount. This process doesn’t end with Family Start and we will be working our way through all of our contracts. There is over $550 million of contracting for services that MSD does and we are demanding that they all be up to a high standard. You will see the outline of this programme of work over the upcoming months. I know what you demand of me as your Minister. You demand that I provide quality services to those families that need it most and that I do it in partnership with you. The New Zealand public also demands that I don’t turn a blind eye to substandard practice and that I have the courage to stand up and make the hard calls." In brief I urged them to focus their attention where it is needed - young, unskilled, uneducated women entering and remaining in the benefit system for years. I cautioned that the proposed work-testing will not deter this group and could see even more children added to existing benefits as an avoidance tactic. 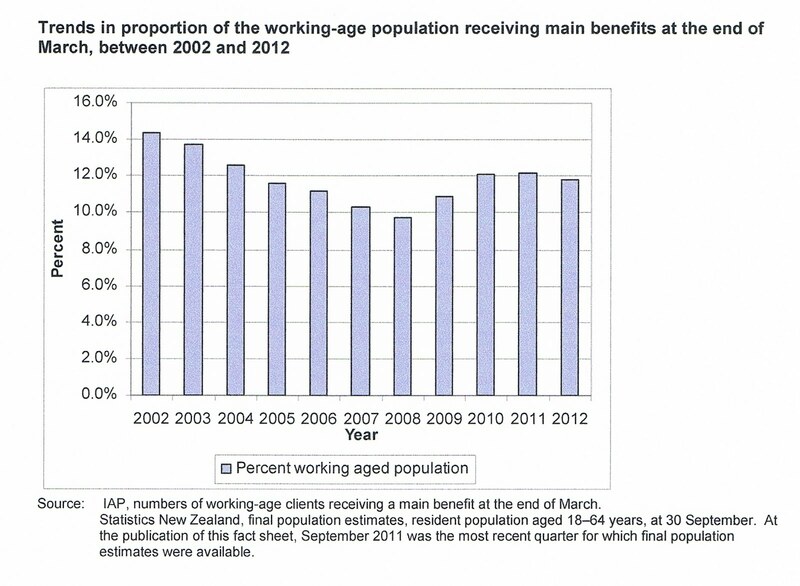 "In New Zealand we are lucky to have a welfare system for those who need it. But under the old system the back to work clock was reset when an additional baby was born to a woman on DPB. For example; if a woman on benefit had another child when their youngest was 18 they would automatically get another 18 years on benefit. In some cases that clock has been ticking for over 35 years and counting. This is not happening in isolation. Around 29 per cent of those on DPB have had a subsequent child while on benefit. Relying on a benefit indefinitely is not healthy, especially for children. As I just mentioned we there are well over 200,000 children living in benefit dependant homes. Tackling this growing problem has been left in the ‘too hard’ basket for too long. It is time to make the hard calls." "It’s time to make the hard calls." I truly hope that she isn't thwarted by nay-sayers, second-raters or even her own Ministry. Bugger. The kids had dental appointments this morning so by the time I got to parliament it was 11am. The 'Closed to the Public ' sign was out and there were people milling about outside the room. I waited, thinking it was a repeat of yesterday when the room was cleared of the public for around 40 minutes. After about 15 minutes the doors were opened and those outside invited in. I trailed in after seven or eight other bods and sat down in the back row. The chair starts to speak saying that all the oral submissions had been heard, and the committee would be moving on....Typically I stopped listening, thinking about the implications of the oral submissions being finished. Perhaps they were going to look at written submissions, I don't know. But it quickly became evident that they were onto committee business and it became uncomfortably obvious that I was persona non gratis, a member of the public. Oooops. I was hurriedly ushered out. So no report from me today. I mentioned to the person firmly guiding me out that the parliamentary website details had indicated the hearings were open to the public from 10 - 4 on both days, and that I hadn't been there before 11, so didn't know the submissions had finished. She said they had changed the website details. When I check now there are no details at all. But here's the thing. They scheduled two days and only needed one and a bit. So the rapidity of the process opposition member and submitters were vociferously complaining about had an effect. Apparently the Green MP moved that the submission period should be re-opened and extended but was outvoted by one vote. Proposed new welfare laws run the risk of discrimination, a parliamentary committee has been told. The Human Rights Commission says there's insufficient evidence to justify imposing compulsory budget management on young beneficiaries. Under the Social Security (Youth Support and Work Focus) Bill benefit payments can be made through cards that can only be used for accommodation and food, with a small cash-in-hand allowance. Chief Human Rights Commissioner David Rutherford told the social services select committee on Friday "the evil of discrimination" had to be avoided unless it could be justified and he didn't think in this case that it was. Deputy Children's Commissioner Jo Cribb said in her submission there must be monitoring to assess the impact of the proposed new welfare regime on young mothers and children. The bill delivers payments for childcare while it imposes new work obligations on sole parents. Ms Cribb said it was essential for childcare to be high quality and accessible - particularly for young mothers in remote areas. Seems to me that laws discriminate against young people canstantly. I don't have to list the ways. As regards young mothers in "remote areas", the Jobs Op policy Labour ran which made unemployed people ineligible for the dole if they moved to areas where there were no jobs should apply to anyone being work-tested. When the chair, National MP Sam Lotu-liga asked the second submitter, Robin Gwynn, if he was aware that Seek is advertising 15,000 jobs he was reprimanded by Labour MP Rajen Prasad for engaging in such a manner . Prasad told the chair to "desist or it will lead to disorder". Having heard from Mr Gwynn that "the government has a moral and humane responsibility to make sure the jobs are available before passing such legislation" which was "bullying the weakest and most defenceless elements of our society" I thought the chair had a reasonable point but the Labour MPs were quite indignant at having such relevancies mentioned. Next up was an arch lefty unbeknownst to me but recognisable by content, David Tolich. He vehemently objected to the video process and that is was arranged by a "private company with taxpayer money" no less. (Ignores that fewer tax payer dollars are required for this facilitation than the alternative). He said it contravened Te Riti O Waitangi and the Constitution. He said that the DPB reforms were an insult to parenting, an abuse of children and parents, and culturally abusive to boot. He wanted the benefit levels pre-1990s cuts restored and, surprise, surprise, the IWTC given to beneficiary parents. It would only cost $400m which he described as "chicken feed". He spoke so long there wasn't much time for questions but Jacinda Ardern managed a patsy about whether he agreed (or words to that effect) that the incentives to work in NZ are very high because of "how low benefit rates are." Next came the Women's Health Action Trust. The presenter, Christy Parker, senior analyst, tried to cram in as much as she could but focussed on the policy that will require women who add a child to their benefit to be available for work after one year. This creates "a differential gender impact because it undermines women's sexual and reproductive rights, fails to value parenting, increases social stigma..."
Parents should be "supported, celebrated and empowered". This legislation would "jeopardise women's self determination." You get the drift. Labour's Mangere MP Sua William Sio, to his credit asked if the group had had any practical experience with private providers that led to their opposition. The submitter pointed to the UK reforms and private providers, and "welfare reforms internationally that have been a failure" but admitted she had no personal experience to call on. Next Leonie Morris of the Auckland Women's Centre. Again she complained bitterly about the process. She wanted to be able to speak in person and described what she could see at her end; just the committee chair and the back of each MP's monitor. She requested that each member introduce themselves. They obliged, but it wasted her tight time allocation. She hammered her organisation's expertise in the DPB. Said that 50 percent of women on the DPB came from a background of domestic violence. (I will attempt to investigate this claim). The other 50 percent have "experienced traumatic separation". She said about women on the DPB, "Most live in poverty, the majority have health problems, the majority have low educational qualifications" but then that the reforms were "mean-spirited and punitive". After such a testimony about life on the DPB it was ironic to hear her slamming attempts to change the system. National MP Mike Sabine (who had been the only National MP engaging with the submitters bar the chair and there were 3 more) asked if the Centre had any problem with women who chose to go back to work when their children were very young (responding to the constant theme that requiring mothers to be available for work devalued parenting and even verged on child abuse according to Tolich). The submitter from the Women's Health Action Group butted in and said the key word was 'choose'. Women being work-tested were unable to choose. If I could have had one moment of redress this is when I would have used it. These women go on and on about rights (human), freedom and choice for beneficiaries not once acknowledging the loss of rights (property), freedom and choice imposed on all those who fund the DPB. I might return tomorrow. Sucker for punishment that I am. The professor then said, "OK, we will have an experiment in this class on socialism".. All grades will be averaged and everyone will receive the same grade so no one will fail and no one will receive an A.... (substituting grades for dollars - something closer to home and more readily understood by all). After the first test, the grades were averaged and everyone got a B. The students who studied 'hard' were upset and the students who studied 'little' were happy. As the second test rolled around, the students who studied little had studied 'even less' and the ones who studied hard decided they wanted a free ride too so they studied 'little'. The second test average was a 'D'. No one was happy. To their great surprise, ALL FAILED and the professor told them that "socialism" would also ultimately 'fail' because when the reward is great, the effort to succeed is great, but when government takes all the reward away, no one will try or want to succeed. Latest benefit statistics have just been released at MSD website. 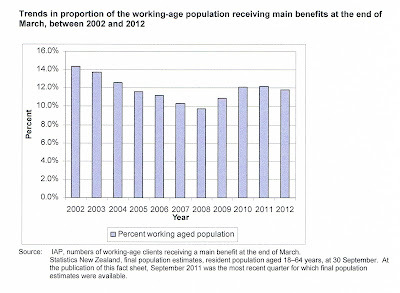 All benefit numbers are down over the year to March 2012. The DPB had the smallest decrease of 72 or 0.1 percent. But at least the trend is positive. Compared to five years ago there are increased percentages of males, Maori and Pacific, 18-24 year-olds and 40-54 year olds making up the total. And a smaller percentage of beneficiaries have worked during the previous year. John Minto, speaking on behalf of the Mana Party, has described the removal of people from state houses in Glen Innes as "ethnic cleansing". Obviously designed to shock and offend, perhaps I should ignore the headline. It wouldn't matter who was in the state houses, the value of the land is too high to have locked up serving a small number. The far left pretend to loathe racism but are happy to invoke its overtones when it suits. Economists and politicians talk endlessly of economic "recovery". But what are we "recovering" to? And can we go there? A "re-" prefixed to the wrong word can seduce us away from the uncertain future to a comforting - but lost - past. Take the Act party, in conference this coming weekend. Twenty years ago, Act's formula for economic and, as a result, social policy powered a lot of thinking and a large amount of government policy, here and in many market-economy countries. Much smaller government, greater individual and corporate freedom and weariness of "welfarism" formed a tide in intellectual and political circles. But by the late 1990s National Party ministers had tired of and grown resistant to Act's lectures and those of its supporting think-tank, the Business Roundtable. Social scientist, Professor Darrin Hodgetts, said New Zealand was "growing poverty". ...New Zealand had gone from one of the most equitable societies – in terms of income distribution – to one of the worst. "And the cracks are getting bigger." What these graphs show is that New Zealand's percentage point change in the Gini index (official measurement of income inequality) was greatest between the mid-1980s and mid 1990s. Between the mid 1990s and lates 2000s the percentage point change was negative. "Things like Working for Families have had an impact but they haven't stopped the growth and the OECD figures are pretty conservative," he said. The OECD measures relative poverty. If the Gini index shrinks there is less relative poverty. In respect of OECD poverty rates go here and look at the graph on page 4. It shows that between the 1980s and late 2000s New Zealand's poverty rate grew at two and a half times the OECD average. But the highest rate of change was in Sweden at 3.7 times the OECD average. Other countries with higher rates of change than NZ were the Czech Republic, Austria, the Netherlands and Ireland. Featuring in negative rates of change were Greece, Spain and France. And they are all in the doggy-do. In a nutshell poverty/inequality grew after the mid eighties. It decreased over the 2000s but has yet to fall to mid-eighties levels. But what is actually growing right now? The number of people clamouring about, and the level of noise being made about poverty and inequality. The Chief Families Commissioner unwisely entered into a political debate and should not now try to wiggle out of it, Labour’s Associate Social Development spokesperson and former Chief Commissioner Rajen Prasad says. ...“There is overwhelming consensus on the value of paid parent leave. The Commissioner needed to base his advice on the merits of the case and not on what he believes the country can afford. That is what Treasury is for. “The Commissioner’s credibility has been damaged and he must seriously consider his position. "It's nothing short of an outrage that the Chief Families Commissioner is defending the current DPB structure in such an overtly political manner. "Hard working taxpayers have every right to expect those receiving a welfare cheque will perform their duties as responsible parents. "Why shouldn't parents be held accountable if they knowingly allow their children to remain truant? "Why shouldn't beneficiary parents be expected to present their children to the doctor and dentist for regular checks, like every other responsible parent? "Dr Prasad should be making a more balance contribution to this discussion. Instead, he has chosen to play politics," says Ms Collins. April 10 Peseta Sam Lotu-liga advises submissions will close on April 13. April 16 Peseta Sam Lotu-liga advises submissions closed, 82 received and 34 will be heard 19 and 20 April. I think I like the pace this government works at. Regarding an earlier social security amendment bill, I had just submitted my comments when the phone rang and I was told to appear the following week. This time I missed the boat. But mainly because I didn't prioritise, I support the reforms and it's the school holidays. But I will try to attend one of the hearing days as audience, if only to blog back on how it's running or provide some offsetting comment to the media. I imagine that 90-something percent of the submissions will be in opposition and presenters will be looking to garner press coverage. "We think when the Government's balance sheet is in order, that provides greater strength for families overall because it is not just paid parental leave we support; it's Working For Families, it's access to early childhood education and many other initiatives." It is a waste of time pointing out how much Key once purported to loath WFF. It's on the record. Perhaps politicians fancy themselves as 'maturing' after a few terms. To me the behaviour smacks more of buckling under the weight of righteous redistributionists professing noble causes. But then one wonders about Key's "we". Surely not all National MPs share Key's enthusiasm for vast social spending, which is what, in the final analysis, has driven European countries to the point of such turmoil? Was I alone in thinking that National was going to get serious about reducing spending this term? Not just as a response to the recession but because it would benefit New Zealand in the long term? How easily I forget my own past utterances. Labour/National late eighties/early nineties were aberrations. Now it would seem NZ has reverted to the familiar political pattern of Labour ramping up the social spending and National falling in behind. This it would seem is a political stalemate there is no escape from.